Chelsea did the double over the Sky Blues last season, will their run continue on Saturday night? 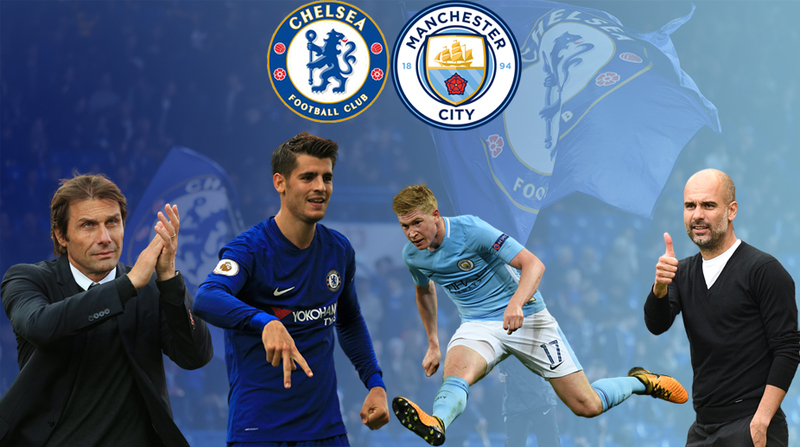 Defending champions Chelsea welcome Premier League leaders Manchester City to what promises to be an exhilarating game of football at Stamford Bridge on Saturday night. The Blues have truly overcome their opening-day slip to be in hot pursuit of the Manchester clubs and will seek to be level on points come full-time. The visitors have been struck with injuries, chiefly that of top-scorer Sergio Aguero, in the past week and would do well to come away from their trip to the capital with a point. David Luiz is suspended for the tie, which means Andreas Christensen is likely to step in to Chelsea’s three-man defence and the 21-year-old will be up against the best of the English top-flight on Saturday. How the young Dane manages to cope with City’s attack, which has scored 16 goals in their last three league games, could prove decisive. Eden Hazard is set to start his first Premier League tie of the season and he, along with top scorer Alvaro Morata, will be key to the Blues’ fortunes at the Bridge. Tasked with keeping City’s midfield generals quiet will be the indefatigable N’Golo Kante as always, but the diminutive Frenchman cannot do it on his own and it will take a collective effort if City are to suffer their first defeat of the season. Many are forgetting that Aguero is not City’s first-choice centre forward, Gabriel Jesus is. And with their power-packed midfield all fit, the Sky Blues still posses a serious threat. Kevin De Bruyne continues to boss things in the middle of the park and their young wingers, Raheem Sterling and Leroy Sane, are in terrific form too. Jesus has been in fine fettle himself and perhaps City were always better suited to play at the Bridge with a single-striker system. However, the fact that they do not have a back-up left-back, with Benjamin Mendy recuperating from a knee injury, does not bode well and it remains to be seen who Pep Guardiola will employ in that position. Chelsea’s wingers are dangerous and the left flank could be exploited so whether Fabian Delph or Danilo get the nod, that area will be a source of concern as the match progresses. Super Stat: Chelsea did the double over Manchester City last season!